The purpose of this policy is to specify the spectrum utilization for the band 1605–1705 kHz and to outline guidelines applicable to the existing users in this band, including their status and timing of any potential re-accommodation to other frequency bands. At the International Telecommunication Union's (ITU) World Administrative Radio Conference (WARC) held in 1979, the band 1605–1705 kHz was re-allocated to the broadcasting service in Region 2 subject to a plan to be established by a Regional Administrative Radio Conference. The first session of this Conference was held in April 1986 (RARC '86). In a Canada Gazette Notice (Notice No. DGIR-001-84, February 11, 1984), the Department advised interested parties of the formation of a Canadian Interdepartmental Committee and an associated Government/Industry Working Group. This Group was committed to formulate Canadian views in preparation for the Regional Administrative Radio Conference to establish a plan for the broadcasting service in the band 1605–1705 kHz and to identify a full range of broadcasting service requirements particularly any new and innovative applications. The first session of the conference developed the technical criteria and the planning method for the band. The second session which was held in May and June 1988 adopted an agreement containing a plan and regulatory procedures. It also agreed on a date to implement the change to the priority of the fixed and mobile services in the band in accordance with the Radio Regulations. The Final Acts of this conference will take effect on 1 July 1990. The Canadian Table of Frequency Allocations with No. 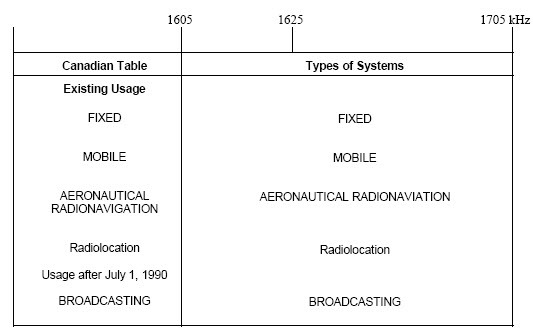 481 of the ITU Radio Regulations currently allocates the band 1605–1705 kHz to the fixed, mobile and aeronautical radionavigation services on a primary basis and to the radiolocation service on a secondary basis until a date decided by the Regional Administrative Radio Conference. This date has now been set as July 1, 1990. After July 1, 1990, the band 1605–1705 kHz will be allocated to the broadcasting service in Canada on a primary exclusive basis. (See Table 1 attached). In Canada, there are a number of stations in the fixed, mobile and radiolocation services operating in the band.1 Existing licensees have already been informed by the Department that after 1 July 1990, they will be allowed only to continue to operate on a non-interference, non-protected basis. It is expected that the licensees of many of these stations will wish to be re-accommodated in other bands. All existing licensees in the band will be strongly encouraged to move to other bands as they make system changes. In the case or the aeronautical radionavigation systems, they will continue to operate under Number. 342 of the ITU Radio Regulations on a non-interference basis. Effective 1 July 1990, existing non-broadcast assignments within the band 1605–1705 kHz will be allowed to continue operation only until a broadcast station goes on air in their geographic and frequency proximity. Subsequent to the CRTC favourable Decision for the broadcasting application, they will be notified that they must change to a new frequency band or cease operation by the in-service date of the broadcasting undertaking if their continued operation would cause it interference or require protection from it. In certain cases, the new broadcasting station may be located outside Canada but could be caused interference from the operation of a Canadian non-broadcast station. The terms of item 2 will also be applied in such cases so far as the cessation of operations in this band when the broadcasting station goes on air is concerned. Technical procedures for implementation in Canada and coordination with the United States near the border areas are being developed and should be available to allow implementation by the target date of July 1, 1990. It is suggested that broadcast applicants contact the Department's Regional or District Offices regarding the licensing status of systems in this band. In the left hand column of the table, upper case denotes a primary service and lower case denotes a secondary service. 1 The Department considers that it has already given existing licensees of mobile and fixed services sufficient notice of the impending changes. Nevertheless, since there is a considerable period between application and actual commencement of broadcast operations, this interim time period should provide the non-broadcast user with sufficient warning of the impending required changes so that these may be carried out in an orderly and cost effective manner.